Hague became a railroad town in the 1800's. There was a post office, community school, sawmill, commissary, and cotton mills. 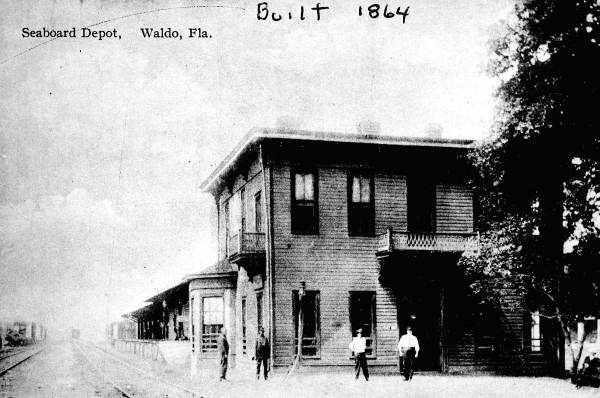 Florida Southern Railroad was built in July 1883. Train Travel began between Gainesville & Hague on September 8th, 1883.Passengers traveling 1st Class paid 50 Cents & 2nd Class paid 40 Cents. Closet cemetery: Freedom Cemetery & Rhuda Branch Cemetery. Nearby Communities in 1895: Fairbanks, post office and railroad service, ﻿1895 population of 250 people﻿. And Paradise, had a post office and no railroad service, in 1895 population of 102 people﻿. Today, the old red caboose on display in the city park holds the key to Waldo’s past. It is the symbol of the town’s rich history and serves as a reminder to its community that Waldo remains a great place to live and to raise a family. Waldo offers new comers the charm of a small town with the benefit of living in Alachua County with its numerous resources and advantages. The 2010 census the population was 1,015, up from 821 in 2000. The house was located on Cracker Hill along the railroad track﻿﻿. George Summer Granger, a railroad engineer, built this elaborate, Victorian-style house before 1894﻿. The original frame structure had a fanciful two-story full-length veranda and a narrow two and a half-story tower. The house remained in the Granger family until 1981﻿.